Hi everyone. 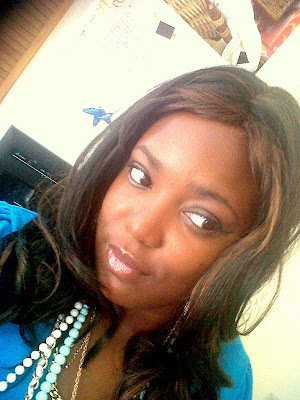 I know most people will introduce themselves by saying, "Hi! My name is Rochelle and I blog over at Oh So Sweet Baker, ladidahdidah" but I’m not going to do that. Ooops, looks like I just did! I guess, I find it hard to to just break the ice. I’m a guest blogger newbie so I don’t really know what I’m supposed to talk about in the intro, so I’m just going to head into the main post I have written. For some unexplainable reason, I don’t seem to make a lot of tarts or pies. A pie or tart isn’t something I’ve eaten a lot of growing up, unlike a lot of American households. I am partial to a bit of apple or cherry pie though. Considering I don’t eat a lot of pies I always seem to come across a few bakeries who think they can actually pull of that glutinous shop bought cherry pie filling that sticks to the roof of your mouth and sell it to me at a ridiculous price. You won’t find any of that horrible filling here. 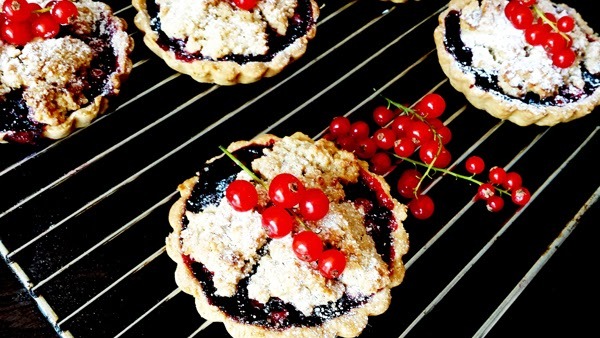 What you will find is a juicy fruity filling encased in a buttery tart shell, topped with a cobbler-like streusel oat topping which makes the whole thing taste sort of like a fruit crumb bar. The best bit is when you take it out of the oven and the juices are bubbling and are still slightly sticky. 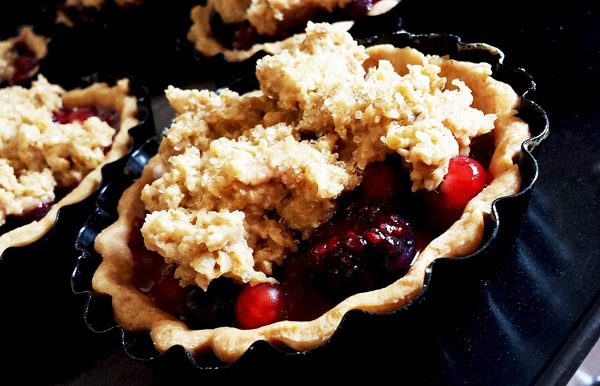 The whole idea for these mixed berry crumble tarts were just the fact that I had some leftover autumnal berries rattling around in the fridge. I have recently started to make more food using up leftovers or in an attempt to clear the fridge, making space for new groceries. I think some of the best food dishes out there were probably made by chucking a few things together and hoping for the best. I know I’ve certainly made some delicious meals using leftovers, like my quick and easy cheater’s pizza, using a cheese scone as the pizza base and topping it with a variety of things from the fridge as pizza toppings. 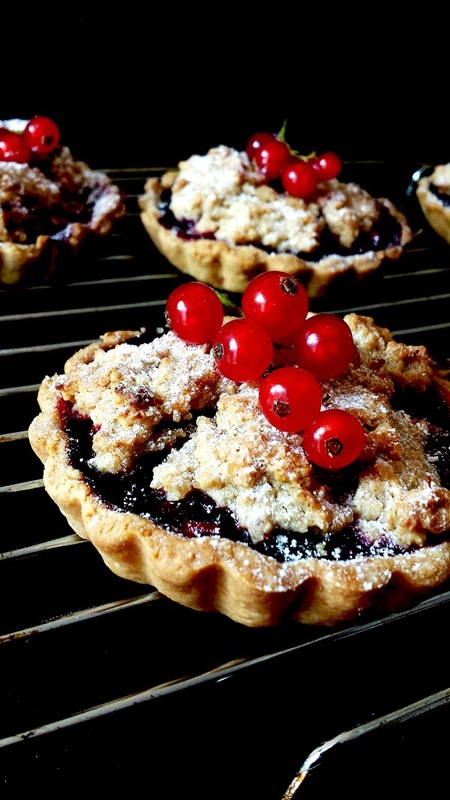 Now I have these mixed berry crumble tarts to add to my archives. 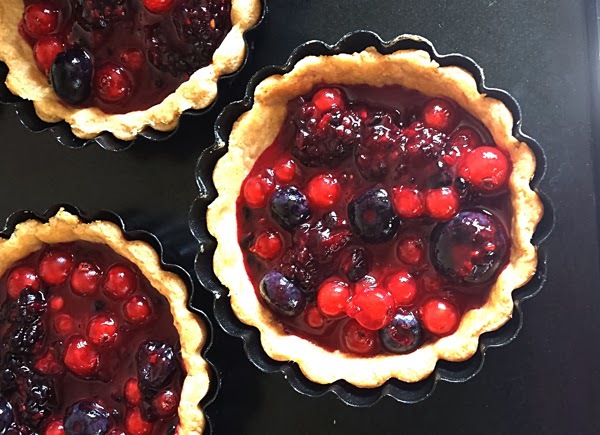 Since this tart is mainly used to use up leftovers, you can use any combination of red fruit or berries you may have and any jam you have as well. Encasing the last of the autumnal berries in a buttery shortcrust tart shell, then topping it with a crumbly oat topping, perfect as a mid-morning or afternoon treat. Add all the ingredients into a food processor except the yolk and the water. Pulse together until it forms breadcrumbs. Add the egg and the water and pulse till it starts to come together. Turn out onto a clean surface and press the mixture into a flat disc. Wrap in plastic wrap and place in the freezer for 10 mins. Remove from the freezer and leave it to soften a bit so it makes it easier to roll. Roll out the pastry 1/4 inch thick and line 6, 4″inch tartlet tins. Place them in the freezer to rest again, and then blind bake them in a 350°F preheated oven for 8 mins. Combine the cornflour (or corn meal) with the lemon juice and blossom water to form a paste. Add the jam and fruits and leave to sit for a few minutes to extract the juice from the fruit. Add the remaining ingredients and mix till just incorporated. Portion out the fruit amongst the blind baked tart cases. Top with the oat topping and sprinkle on the demerara (or turbinado) sugar. Bake for 10-15 minutes in a 350°F oven. When cooled slightly, dust with powdered sugar and garnish with some redcurrants. Use any combination of berries you like that are in season, as they taste better. You can also use frozen berries, just let them thaw out completely before use. If using frozen berries, add an extra tsp of cornflour (corn meal). Instead of raspberry jam, use any berry jam you have. Orange blossom water is available to purchase from here. PS- I am currently having a little giveaway on my blog! Click here to enter to win! Rochelle is the name and baking is the game. I am a 19 year old baker and pastry chef from London, UK, who spends all her time in the kitchen coming up with delicious baked goodies. Bacon Lover, Cocktail Drinker, Salted Caramel Obsessor, Mint Green Adorer. **Interested in taking over Sweet Lavender Bake Shoppe for a day? Click here to find out how to do so! I love red currents!! yum. you have to be from Europe to get berries like that! !